The Subaru BRZ STI Sport looks like a real key to happiness on a budget. Just imagine parking in the shade, hopping out and letting the wind catch your hair as you run down a mysteriously empty beach. It sounds like a dream, until you realize the car has the same, non-turbo four-cylinder engine as any other BRZ. That’s right. The “highest grade” BRZ (more like BRZzzzz, right? ), as Subaru likes to call the STI Sport, will have no engine modifications, no turbocharging, no power difference. You’ll get the same 200-ish horsepower that comes with any other BRZ, only with this car, you get a fancy STI badge. We expected this to be the case, but it still hurts. There are a few differences between this STI Sport and the regular BRZ, which shares a platform with the Toyota 86. The STI Sport is for the Japanese only market for now, and changes include improved steering responsiveness, performance-oriented suspension upgrades, and 18-inch wheels. That’s pretty similar to the BRZ performance package Subaru offers in America. 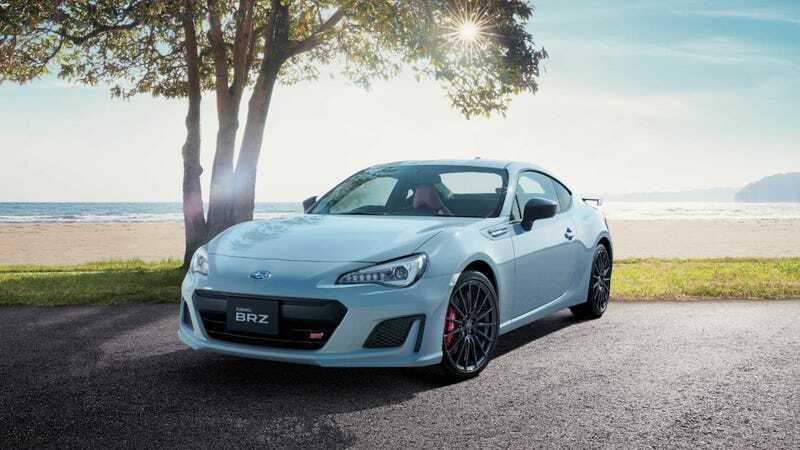 The car itself won’t have any more power than a regular rear-wheel-drive BRZ, with about 204 HP at 7,000 RPM on the version that has a six-speed manual transmission. (The car can come in an automatic, which isn’t the case with the WRX STI. You can even see the cursed thing in that interior photo above. Tricky manual-looking automatic shifters, be gone!) The manual is $31,057 at current exchange rates, and the automatic is $31,580. In addition to the regular line of BRZ STI Sport models, Subaru will make only 100 of the “cool gray khaki edition” shown in these photos. It’s hard to know how to feel about this car, even if it is only for one market that may or may not be your own. The thought of a BRZ STI, in all of its sporty yet practical RWD glory, is something of dreams that came just in time to cheer us up for the holiday season. But hearing that the performance package doesn’t include a little more power... that one hurts. That one hurts more than remembering it’s only Wednesday.